Since 1998 Weather Graphics has produced a variety of historical weather datasets, starting with our Surface Archives and Upper Archives sets. Over the years we have responded to a growing interest by hobbyists and demand from insurance and energy companies with a diverse set of data products to meet many different needs. If you don't see a product you need here, please email us to discuss your needs. 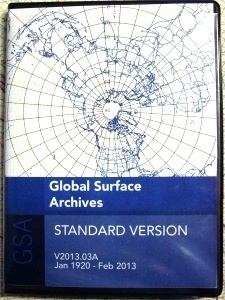 Special note: Total Surface Archives and Total Upper Archives have now been superseded by the Global Archives below. Global Surface Archives is an unprecedented archive consisting of almost a quarter terabyte of SYNOP and METAR data for the entire world. Recreate historical weather situations for anywhere in the world! This data is NOT available anywhere else and was constructed over a period of years from packed records on 9-track tapes. METAR remarks are available from 1975 onward, and data after 1998-2001 is seamlessly replaced with actual observations received over NOAAPORT. The SYNOP data includes regional 333 groups, and SHIP synoptics are included. The optional Professional Version adds a station collective volume so you can view trends in METAR and SYNOP data at any given station from day to day, and a decoded tabular volume so you can load data into Excel. 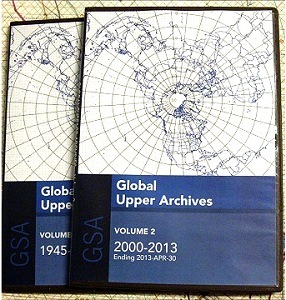 Global Upper Archives is the largest collection of worldwide radiosonde data anywhere in the standard TTAA/TTBB/PPBB format. The data goes back as far as 1945. This data is NOT available anywhere else and was constructed over a period of years from packed records on 9-track tapes. 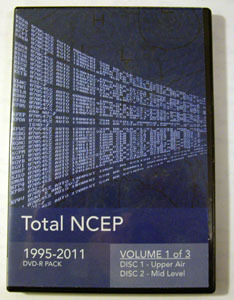 Total NCEP is a vast compilation of charts generated by NCEP (National Centers for Environmental Prediction). This includes the official NCEP (NMC) 200, 300, 500, 700, and 850 mb analysis, surface charts, IFR/MVFR aviation charts, snow depth, 24-hour precipitation, maximum/minimum temperatures, and thickness. Also includes hemispheric charts of both northern and southern hemispheres. There are over 300,000 files totalling 28.8 GB! 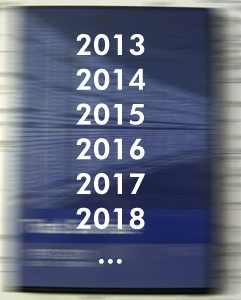 Note that chart availability varies by date; some charts were retired or phased in; others may be are unavailable. Comes on 4 DVD-R discs; not zipped, all graphics in GIF format. 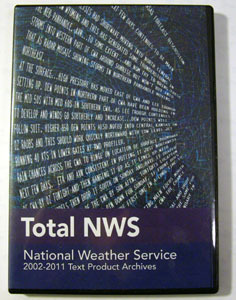 Total NWS is a compilation of NWS alphanumeric text bulletins from all offices, including forecasts, nowcasts, SFD/AFD forecast discussions, climate summaries, warnings, special weather statements, and hurricane bulletins. The collection totals an astounding 75 gigabytes of text data! Essential for weather historians, forensic meteorologists, insurance companies, and researchers. Comes on 3 DVD-R discs; zipped by year/month. All bulletins nationwide of a specific type for a specific calendar date (2 am EST starts a new calendar date) are placed in one file. Content is plaintext (ASCII) format for easy reading or sorting. 1 Data before June 2002 is limited to forecast discussions only. Before January 2004 data is limited to forecast discussions and warnings. 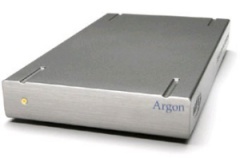 ARGON is a database provided on an external USB hard drive containing MySQL tables of surface and upper air weather data for North America. It is constructed from actual METAR and radiosonde observations, allowing you to harness the power of MySQL to run queries on all available observational weather records for North America from over 2000 NWS, FAA, DoD, and Canada EC/DoT observation sites. You can quickly find averages, means, deviations, and extremes for temperature, wind direction, wind speed, wind gust, altimeter setting, sea-level pressure, weather, visibility, and much more. This is an essential tool for energy and insurance industry, researchers, and dedicated hobbyists. Special note: This product has no interface or software and requires basic knowledge of MySQL. A starter guide with a walkthrough and sample commands is included. Worried about missing out on updated disc sets? Pair the Lifetime Update option with your purchase and you will receive FREE updates on ALL archive disc sets (does not apply to Argon) long as we continue to produce archive products. Updates occur at least once per year and we are working towards issuing semiannual and quarterly updates. There is no requirement to buy Lifetime Updates now; you may add this at a later date. The price we charge helps subsidize our incurred costs for duplication, packaging, and shipping. Updates are not automatically shipped; when an update is desired, you must initiate a request and confirm your address. Many customer addresses change over the course of several years and in some cases the updates are not wanted, so this method helps keep our losses down from postage returns and unwanted goods. We reserve the right to make minor changes to the disk sets, including changes in file naming structures and content. As of February 2014 we offer online updates for most products. SPECIAL NOTE: All products that need to be shipped will incur a per-package charge of actual postage to cover the significantly increased postage fees.